I just love making blankets! When I started off crocheting my heart was set on amigurumi, but since then I've found a great love for the repetitiveness and the process of creating a blanket. It's just so great to have a project you can just sit down with, not have to keep checking the pattern, and crochet. While I watch a movie, watch my husband play a video game or listen to an audiobook. So with having friends who are due with their first baby in a few months, of course I had to make them a blanket! I may have mentioned earlier how much I love blankets made from Stylecraft Special DK. They're just perfect. So I ordered a bunch of greens (as well as some other colours for potential later projects of course). I decided on Spring Green (which I loved from my Attic24 Cupcake Blanket), Grass Green, Kelly Green, Bottle and Teal. Here's my first sketch of the blanket (apologies for how the colours have scanned, you get the idea right?). After this I realised - hey, I actually only have a limited amount of yarn, what if I aim for this and am way off in the amount of yarn I need. Especially as I knew that I wanted to join the hexagons as I made them, rather than waiting until they were all made and then sewing them together, I knew I needed to have a plan that matched the amount of yarn I had. I was undecided as to if I wanted to do 5 or 6 round hexagons, so I crocheted a hexagon putting stitch markers at the 5 and 6 round points, and then I undid it to measure how much yarn I'd used. 5 rounds used about 16m and the 6th round was an extra 8.4m. 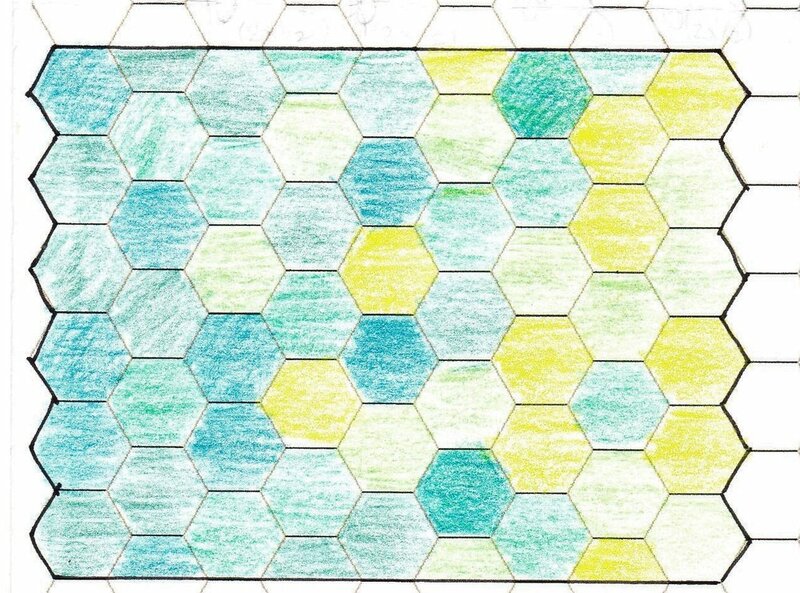 After lots of scribbles I figured out that from my 5 balls of Stylecraft Special DK if I did my hexagons with 5 rounds I could make a blanket about 79 by 118cm (31 by 46.5 inches) made up of 72 full hexagons and 10 half hexagons. 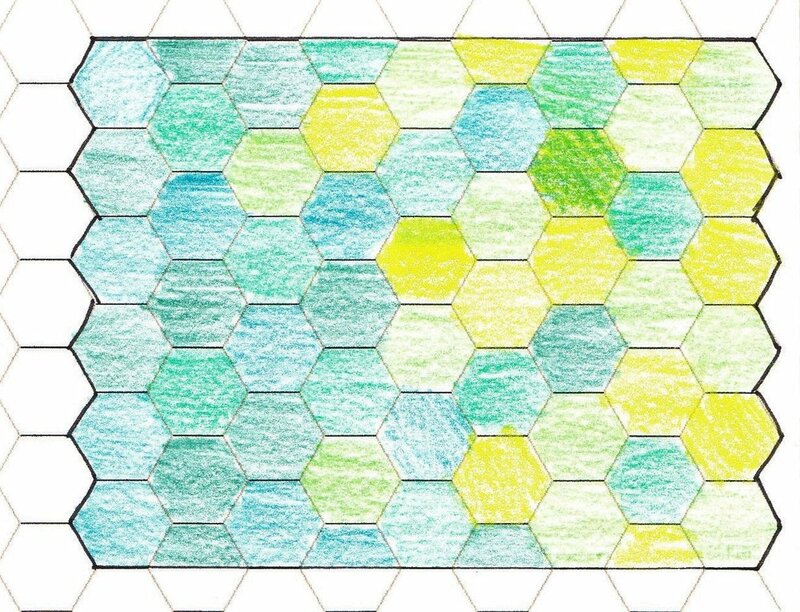 If I made hexagons with 6 rounds I could make a blanket 76 by 107 cm (30 by 42 inches) made up of 50 full hexagons and 8 half hexagons. I decided to go with the 6 round hexagons, with a slightly smaller finished blanket I wasn't certain my calculations were correct and I thought the slightly smaller one would be less risky. Here are some sketches for what I was aiming for with my blanket. I ended up doing my plan by assigning each colour a number and filling out the grid with pencil because the plan had to be just right before I started. Here are some progress shots of the blanket. I love seeing it come together especially when I’m doing a join as you go. The particular join I used for this blanket is great. It’s called the PLT Join As You Go by Cypress Textiles. It looks like it’s finished here, but actually at this point I still had 116 ends to weave in! I know I should weave them in as I go, but I just get too excited by crocheting and joining new hexagons. So they get left until the very end. Here’s me sewing in the ends after Oscar the Octopus refused to do it for me even though he has so many legs! On an unrelated note, here are some succulents I recently received as a lovely gift – aren’t they beautiful! I did try uploading these photos to my personal Facebook page, but Facebook compressed them really badly. So here we are! Click on the photos for a closer look! Hope you have had a good Easter long weekend and take the time to appreciate the things around you - like these beautiful succulents!